: Makes about 10 sandwiches with about 1/4 pounds of meat each. : Allow about 2 hours to cook and another 3 hours to firm the meat for slicing in the refrigerator if you don’t have a meat slicer. You need 90 minutes to cook a 3-pound roast, or about 30 minutes per pound. You can cook this well in advance and refrigerate the meat and juice and heat it up as needed. You can even freeze it. This is a great Sunday dish because the smell of the roasting beef and herbs fills the house. After you cook it, you need another 30 minutes to chill it before slicing. Top sirloin, top round, or bottom round are preferred in that order. For tenderness, especially if you cannot cut paper thin slices. David Rosengarten, the famous cookbook author and TV chef, uses chuck, a fattier cut, so the meat will be more tender and flavorful. “Luxurious” is the word he used. Problem is that you’ll have to chill the pan drippings after cooking in order to skim off the fat. I have encountered lively debate on the makeup of the juice as I developed this recipe. Some insist you must use bouillon to be authentic while others use beef stock, veal stock, or a soup base, and simmer real onions and garlic in it. The bouillon advocates have won me over on the authenticity argument, although I must confess, the soup base is my favorite. 1) If you wish, you can cut small slits in the surface of the meat every inch or so and stick slivers of fresh garlic into the meat. If you do this, leave the garlic out of the rub. Otherwise, mix the rub in a bowl. Sprinkle it generously on the meat and massage it in. There will be some left over. Do not discard it, we will use it in the juice. Let the meat sit at room temp for about 30 minutes. Meanwhile, preheat the grill or oven to 400A°F. If you are cooking indoors, put a rack just below the center of the oven. 2) Pour the water into a 9 x 13″ baking pan and heat it to a boil on the stovetop. Dissolve the bouillon in the water. It may look thin, but it will cook down and concentrate during the roasting. Pour the remaining rub into the pan. Place a rack on top of the pan. Place the roast on top of the rack above the juice. Roast at 400A°F until interior temperature is 140A°F for medium-rare, about 30 minutes per pound. This may seem long, but you are cooking over water and that slows things down. The temp will rise about 5A°F more as it rests. Don’t worry if there are people who won’t eat medium-rare meat. The meat will cook further in step 5, and you can just leave theirs in the juice until it turns to leather if that’s what they want. If you use a rotisserie on your grill, you can cut the cooking time in half because the spear and the forks holding it in place will conduct heat into the interior. Be aware. This recipe is designed for a 9 x 13″ baking pan. If you use a larger pan, the water may evaporate and the juice will burn. If you have to use a larger pan, add more water. Regardless of pan size, keep an eye on the pan to make sure it doesn’t dry out during cooking. Add more water if necessary. 3) While the meat is roasting (Mmmmm, smells sooooo good), cut the bell peppers in half and remove the stems and seeds. Rinse, and cut into 1/4″ strips. Cook the peppers in a frying pan over a medium-high heat with enough olive oil to coat the bottom, about 1 tablespoon. When they are getting limp and the skins begin to brown, about 15 minutes, they are done. Set aside at room temp. 4) Remove the roast and the juice pan. Let the meat sit for about 30 minutes for the juices to be reabsorbed into the meat fibers, and then place it in the coldest part of the refrigerator. Let it cool for about a few hours, long enough for the meat to firm up. This will make slicing easier. Slice the meat against the grain as thin as humanly possible, preferably with a meat slicer. My wife remembers that her family would cook the roast and take it to the butcher to slice on his machine. That’s a good strategy if you don’t have a meat slicer. This, of course, is against health codes today. If you don’t have a slicer, use a thin blade and draw it along the red part of the meat. If you try to cut down through the crust you will be cutting it too thick. 5) Taste the juice. If you want you can thin it with more water, or make it richer by cooking it down on top of the stove. In Chicago beef stands it is rich, but not too concentrated. Then turn the heat to a gentle simmer. Soak the meat in the juice for about 1 minute at a low simmer. That’s all. That warms the meat and makes it very wet. You can’t leave the meat in the juice for more than 10 minutes or else it starts to curl up, squeezes out its natural moisture, and toughens. If you go to a beef stand and the meat is really curly, they have committed a mortal sin. At Mr. Beef, for example, I watched them take a handful of cooked beef and dump it into the juice every time they took out enough for a sandwich. This also enriches the juice with meat protein and seasoning from the crust. 6) To assemble the sandwich, start by spooning some juice directly onto the bun. Get it wet. Then lay on the beef generously. Spoon on more juice (don’t burn your hand). Top it with bell pepper and, if you wish, giardiniera. If you want it “wet”, dip the whole shootin’ match in juice. Be sure to have plenty of napkins on hand. 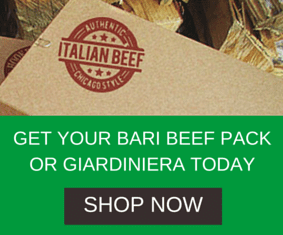 Buy Italian Beef, Giardiniera or Italian Sausage Click Here. Have a recipe you would like to share? Go to our recipe submission form.